#PureBoardShop is Adding to Their Shoe Wall of #NikeSB, #Adidas, #Vans, #DC, #Gravis and #Ipath with the Holiday Line-Up of #Supra. 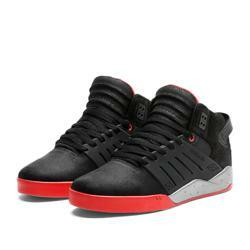 2012 Holiday @suprafootwear Are Now In Stock At Pure Board Shop. "The Skytop III are made with incredible color contrasts. Skaters and sneaker heads alike are digging 'em. Supra Footwear is one of the few shoe brands that has state of the art skateboarding technology, an awesome skate team and unreal street appeal in a number of urban style shoes. The Backwood is an all-weather boot/athletic-shoe hybrid design. Built atop a two-part outsole that is rubber and SUPRAFOAM®: the heavy-duty rubber, lug bottom tread pattern is ideal in any terrain, and the SUPRAFOAM® sole makes the boot lighter and more comfortable. The boot's strength is enhanced by metal D-ring eyelets and woven rope laces. The gusseted tongue protects the foot from inclement weather and the SUPRAFOAM® footbed provides all day comfort. The third generation of the Skytop is a mid top silhouette with a molded TPR cage that has distinct lines reflecting the original Skytop upper pattern. A modern cup sole is outfitted with a full-length, SUPRAFOAM® midsole as well as a molded PU footbed for superior comfort. Rubber sidewalls protect the skate sensitive areas around the toe box. Internal mesh padding and a neoprene bootie in the tongue and toe box add support and a snug fit. Removable SUPRAFOAM® heel pod with encapsulated air pocket provides extra impact protection. The outsole tread pattern is designed for increased flexibility and excellent board feel. Pure Board Shop opened its doors on May of 2005. After co-owning Evolve Board Shops in Annapolis and Bethesda Maryland from 1993 to 2003, Robby Roberts put Pure on the streets a few years later. Its ease of access and parking make it a destination shop for riders and urban street wear fans alike. With their mix of products and variety in skate, snowboard , surf and exclusive street wear and shoe brands Pure’s customers extend far beyond their Annapolis location. Pure prides itself on customer service being its number one priority, with product knowledge and having the right product mix a close second. The store and the website feature an ever growing inventory from brands such as Nike SB,Nike Snowboarding, Travis Rice, Lib Tech, Adidas skateboarding, Vans, Levi Skateboarding, Diamond, HUF, LRG, Neff, RVCA and The Hundreds, as well as a large selection of Sunglasses and other accessories. The shop also prides itself on having the largest inventory of longboard equipment in the area; with brands like Landyachtz, Rayne, Caliber, Cult, RAD, Abec11 and many more. Pure puts on skateboard jams and video premieres at their local skateboard park as well as sponsors many longboard slide jams and races in the Metro Area.